How is Saudi Arabia dealing with citizens’ demands for greater rights and recent protests in its own Eastern Province? Across the country, women have been rallying for increased political rights and representation. In Jeddah, the #Women2Drive movement called on the government to grant women the right to drive and gained international attention last summer. Saudi Arabia’s King Abdullah also announced last year that women would be allowed to sit on representative councils in the future. Over the past several months, members of the country’s Shia minority – centered in the Eastern Province – have called for government reforms and an end to discriminatory practices against them. The Saudi government expressed concern that these protests are being backed by foreign agents and declared that security forces “will deal firmly with agitators.” A number of protesters have been reportedly killed. In this episode, The Stream talks with social activist and writer Princess Basmah Bint Saud Al-Saud and Ebtihal Mubarak, a journalist and blogger raised in Jeddah. What do you think? 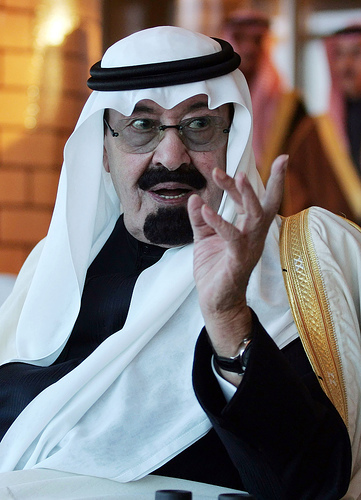 Will Saudi Arabia see a wave of reforms? Send us your thoughts and comments on Facebook or Twitter using hashtag #AJStream. Princess Basma bint Saud bin Abd Al-Aziz Aal Saud, niece of Saudi King Abdullah, is an outspoken critic of the Kingdom's ruling ministers and governors. She has called for reformed policies towards women in Saudi Arabia, who she believes are entrapped in a modern-day form of slavery. Pictured below are King Abdullah (far left) and Saudi Arabia's other ruling elite. In this video, King Abdullah declares that a respectable society upholds the truth and praises the security forces for protecting the Saudi people. "God knows that the people are in my heart," he says. The video below shows King Abdullah and President Obama at the White House on June 29, 2010. The Saudi King makes a joke about the media's power to sway public opinion against or in favor of the government. On Sept 25, 2011, the Kingdom of Saudi Arabia granted women the right to vote and run for positions in municipal elections for the first time. Although women are slowly gaining rights, there are still significant disparities between genders. For instance, women outnumber men in university enrollment (56% and 44% respectively) but only make up 10% of the workforce. Sheikh Assim Al-hakeem, an instructor at Saudi Arabia's Knowledge International University, believes that women should not travel anywhere without a mahram, or male guardian. Even if they receive permission from their parents, Sheikh Al-hakeem says what is needed is Allah's permission. Dr. Alhabdan, a Saudi Arabian cleric, tweets a link describing it as a "helpful search for those who want to know more about the rules of women participating in politics." In this tweet, Dr. Alhabdan says that the issue of whether women should be allowed to enter the Shura Council can be found from looking at the Prophet Mohammed. The link goes on to say that women can give their opinion and advice without being a member of the Shura Council and mixing with men in meeting rooms and gatherings. Scores of Saudi women got behind the wheel and took to the streets on June 17, 2011 to protest the driving ban placed on women. Saudia Arabia is the only country in the world where women are banned from driving. Manal Al Sharif, a 32-year-old Saudi woman, was detained for two weeks after posting a video of herself driving on the internet. In the video, Al Sharif says women need to learn how to drive in order to protect themselves and their families. On March 11, 2011, protesters organized a "Day of Rage" to express their grievances against the Saudi regime. Several hundred protesters came out in the cities of Hofuf, Awwamiya, and Qatif in the Eastern Province to demand the release of political prisoners. This video shows police officers calmly interacting with protesters and assuring them that their concerns are heard and will be addressed. In the following video, women marched to show solidarity and support for Shi'a political prisoners in Saudi Arabia. Women and children have joined and even led the protests in the Eastern Province. Several Shi'a Muslims have been killed in the unrest. The poster and symbolic coffin below commemorate "The Honorable Martyrs of Qatif." The following videos below show the funeral procession for Essam. The video below shows protesters in Qatif demonstrating their displeasure with the Crown Prince Naif, who is next in line to inherit the throne. The protesters chant "Naif, you're a terrorist. Naif, you are a liar." Firas Buqnah, a young Saudi film maker produced a short documentary in 2011 entitled "<em>Mal'ub 'Alayna</em>" (Played on Us: Poverty Saudi Arabia) highlighting the poverty among 22% of Saudi Arabia's population. Saudi authorities responded swiftly by arresting Boqnah and his film crew. Saudi Arabia is considered the least democratic country in the Middle East, ranking high in inequality and very low in democracy. Saudi Arabia ranks 160th out of 167 countries for democracy according to the 2010 Democracy Index published by the Economist Intelligence Unit. A map by the US Energy Information Administration shows the Eastern Province city of Qatif, where the unrest is now concentrated, to be located near the center of a key oil field and adjacent to a strategic Arabian port.